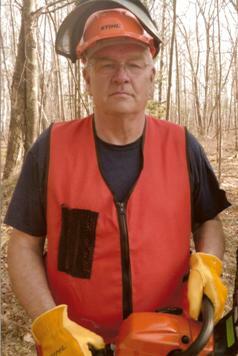 Hello, my name is Jim Olive and I am a chain saw safety trainer, with 15 years of experience. Being a safety trainer has been a rewarding, challenging and life changing opportunity. As a young boy, my family lived and worked in the heart of the Nicolet National Forest in Northern Wisconsin. My father was a logger and he was my first teacher about chain saw usage. No matter how safe you try to be, accidents do happen. In my mid-teens I experienced getting hit by a tree and receiving a scar on my hand from a kick back off an aggressive cutting chain. You will find when you talk to people who have been using a chain saw for years, many have had bad experiences. In the late 1990’s I began attending safety classes put on by FISTA. These were designed to help loggers to be safer and more productive, which was beneficial to me in my logging business. In 2001 a “Safety Trainer” position became available and I was hired. To be a “Safety Trainer”, first I had to break some of the bad habits I had learned up to this point in life. A common bad habit that I had was not wrapping my thumb around the handle bar when using a running chain saw. By doing this your hand is less likely to come off the handle bar and lose control of the chain saw during a kickback. The other side of being a trainer is the ability to communicate your knowledge and skill to another individual. Every class has different skill levels from the novice to the expert. The challenge is to work with each person according to their degree of experience. A change in direction with FISTA has given me an opportunity to form this new chain saw safety training company with another long time FISTA safety instructor, Lee Schauman. We would like to share with you some of the newer and safer techniques that are now being used. (See Proper Notching.) Many participants in past programs have asked me, “Why hasn’t someone shown us these techniques before?” All I can tell them is, “Now that you have used the techniques today please continue to use them and share your knowledge with others.” It is very rewarding to have an attendee tell me he took the class on the recommendation of a former trainee. Lee and I look forward to working with you and your group demonstrating chain saw safety techniques and giving you the opportunity to participate. Please feel free to contact us with any questions you may have or to discuss setting up a chain saw safety training session. My name is Lee Schauman, Safety trainer for the newly formed chain saw safety company – Chain Saw Safety Specialists, LLC. I have been in the logging business for most of my life here in Northern Wisconsin. As a boy I would help my Uncle cut Balsam out of his swamp in the Winter . Then I earned most of the money for my college degree by cutting wood in the summer. After a few years in major paper industry settings as a Safety Coordinator, I decided to start my own logging business. From that day to the present, I have been actively involved in the logging industry, and during the last 15 + years as Safety Trainer and Lead Safety Trainer for the Forest Industry Safety and Training Alliance (FISTA). In addition, my brother–in–law and I have an excavation business which takes up most of our spare time. Safety Training for chain saw operators has become a passion of mine because, like almost every one of us that uses a chain saw, we learn how to do it by trial and error. Offering training just makes sense to me because statistically, chain saws are one of the most dangerous tools we can use. Jim Olive and I have the expertise and knowledge to provide that training. If we can eliminate one serious injury, or reduce the severity of injuries that occur by doing so, it becomes well worth the effort. When I’m not training, doing excavating, or continuing our Logging business, like most of us in the North Woods, I enjoy the outdoors. I’m an avid hunter, fisherman, and general outdoor enthusiast. I enjoy boating, 4 wheeling, and fall weather. Of course, a couple of things I don’t particularly care for as far as outdoor activities is concerned is raking leaves and shoveling snow!! 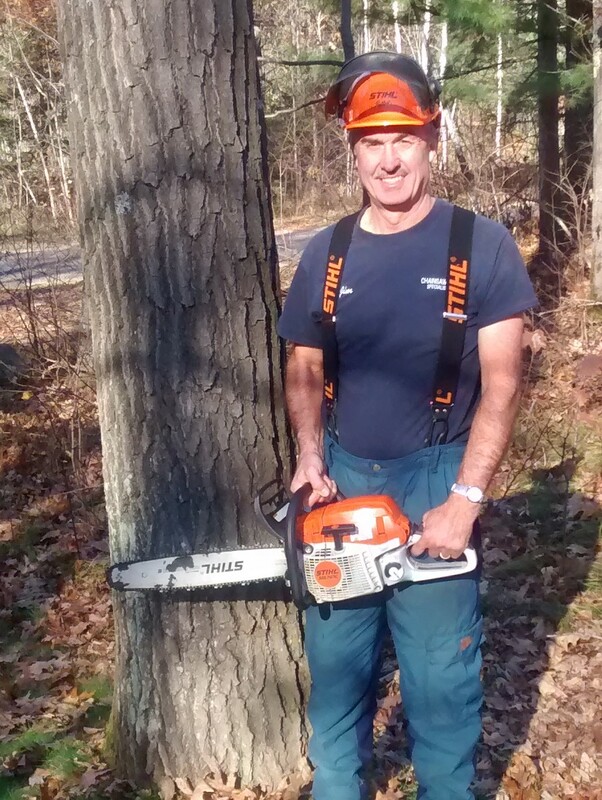 Jim and I have started this business here in Northern Wisconsin because we understand the value of professional training for chain saw operators. If you would like more information about our programs or schedules, please contact us at your convenience.